We have two standard sizes of document destruction bin available. 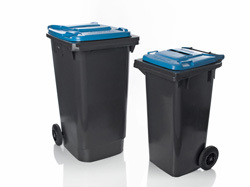 Our 120lt wheelie bins are 92cm high. They are 48cm wide (side to side), and are 54cm deep (front to back). Our 240lt wheelie bins are 1.04m high. They are 57cm wide (side to side), and are 72cm deep (front to back). A 240lt wheelie destruction bin packed with standard office paper will take approximately 65kg of paper. The amount of paper that will go in a wheelie bin will vary depending on the type of paper and the density of packing. 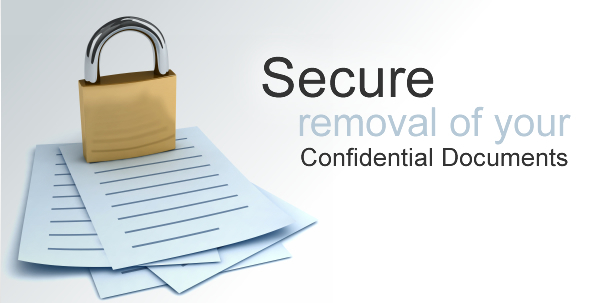 Our Document Destruction Wheelie Bins are lockable and securely removed from your site and all documents are shredded. The wheelie bins are a convenient way to manage paper that is no longer required. With our bin in your office you always have a way of disposing of paper securely and keeping order on your desk and in your filing system by disposing of surplus documents immediately and securely. When you are having a clean out of your files a wheelie bin is a convenient and efficient way of securely handling your unwanted files. You can put the secure destruction wheelie bin next to any filing cabinet you are sorting through and dispose of your paper immediately as you sort. If you have your data stored in other ways (for instance electronically) then we can also organise secure destruction of the storage media. We can pick up these in the same ways as the paper files. We can collect all you destruction items at the same time, however we do need non-paper storage devices separated from paper. Our large industrial shredders will easily cut staples and paper clips so these do not need to be removed prior to our collection. There is no need to remove your paper from ring binders or other files. We are a specialist Document Shredding company, and we aim to provide a service that meets your requirements in the most effective way.